As our need and consumption of technology is increasing, the area of forests is decreasing. Over the years, we have become increasingly aware of the ill effects of the dwindling tree population. While we all know that it is important to plant enough trees to purify the air we breathe, little is actually being done in the major metropolitan cities around the world where the problem is at its worst. China, the highest populated country right now, is a major victim of increasing pollution as they clear any remaining forest land to build urban concrete structures for inhabitaiton. So to manage such a situation, China has come up with a virtuous solution! They knew that it is impossible in the cities to create woodlands and forests because of all the offices, shops , homes etc., so instead they will plant the same amount of trees vertically i.e. upwards within buildings! After a never-ending series of record-breaking glass bridges—and even a glass bathroom—construction has begun on Asia’s first vertical forest in Nanjing. 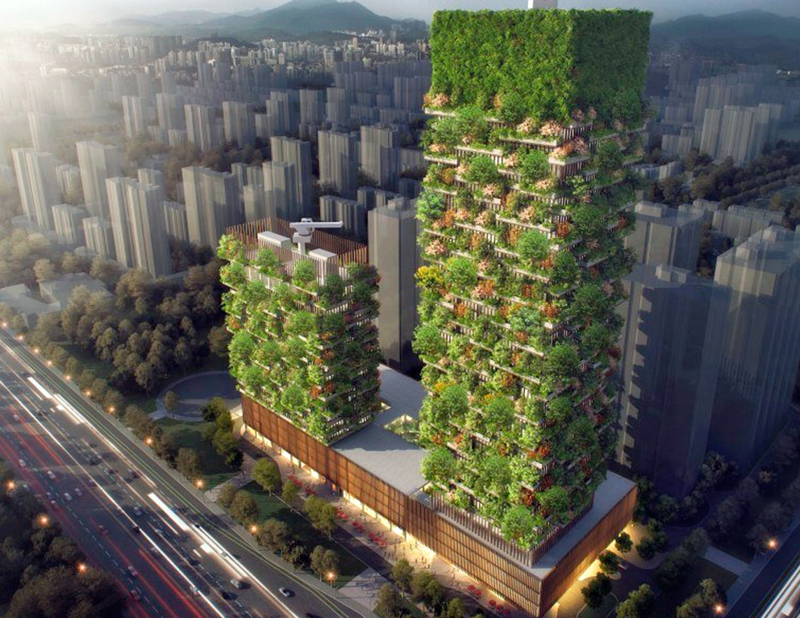 A group of architects have designed two magical buildings called the Nanjing’s Green Forest. These are described as Asia’s first vertical forests, and are essentially giant office towers covered in plants, green tanks, and balconies. Located in Nanjing Pukou, which Stefano Boeri Architetti’s press release describes as an area that will likely lead modernization efforts in the south of China’s Jiangsu province and help develop a Yangtze River economic zone. Nanjing Yang Zi State-owned Investment Group Company Limited is promoting the towers and is listed by Stefano Boeri Architetti as an investor in the project. The two towers are characterized by the interchange of green tanks and balconies, following the prototype of Milan’s Vertical Forest. 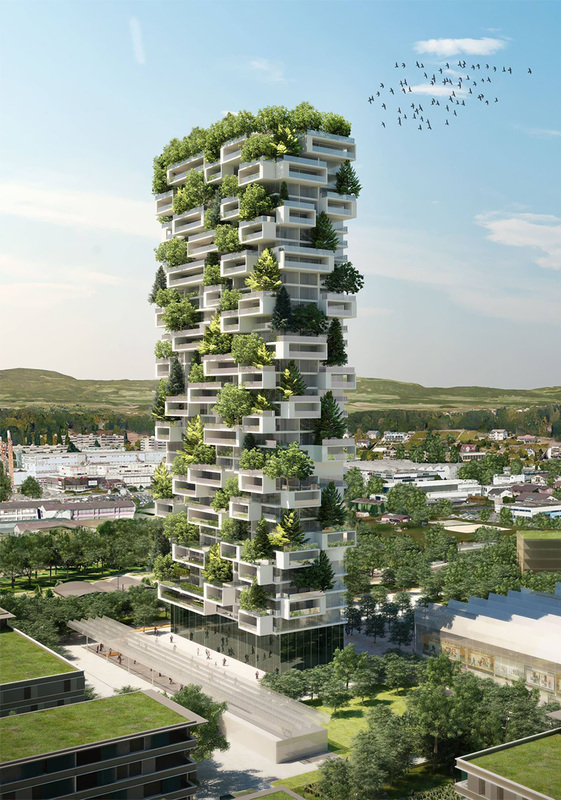 Around the outside of the buildings there will be 600 tall trees, 500 medium size trees, and 2500 cascading plants and shrubs, to create a tower of stunning greenery. The greenery, which will cover a 6,000-square-meter area, is expected to absorb 25 tons of carbon dioxide each year while producing 130 pounds (60 kilograms) of oxygen each day. The taller tower, which will be 200 metres high, will host offices, a museum, a green architecture school, and a private club on the rooftop. The smaller tower, which will be 108 metres high, will serve as a Hyatt hotel, with shops, a food market, restaurants, and a swimming pool on the rooftop. What Makes Nanjing’s Green Forest Special? Nanjing’s Green Forest increases biodiversity. It helps to set up an urban ecosystem where a different kind of vegetation creates a vertical environment which can also be colonized by birds and insects, and therefore becomes both a magnet for and a symbol of the spontaneous re-colonization of the city by vegetation and by animal life. Nanjing’s Green Forest helps to build a micro-climate and to filter dust particles which are present in the urban environment. The diversity of the plants helps to create humidity and absorbs CO2 and dust, produces oxygen, protects people and houses from harmful sun rays and from acoustic pollution. In order to understand the need for water, the plan for these buildings took into account the distribution of plants across the various floors and their positioning. When could we expect Nanjing’s Green Forest? The vertical forest is due to complete construction in 2018. The architects behind the project are the same that designed the vertical forests in Milan, Italy and Lausanne, Switzerland. 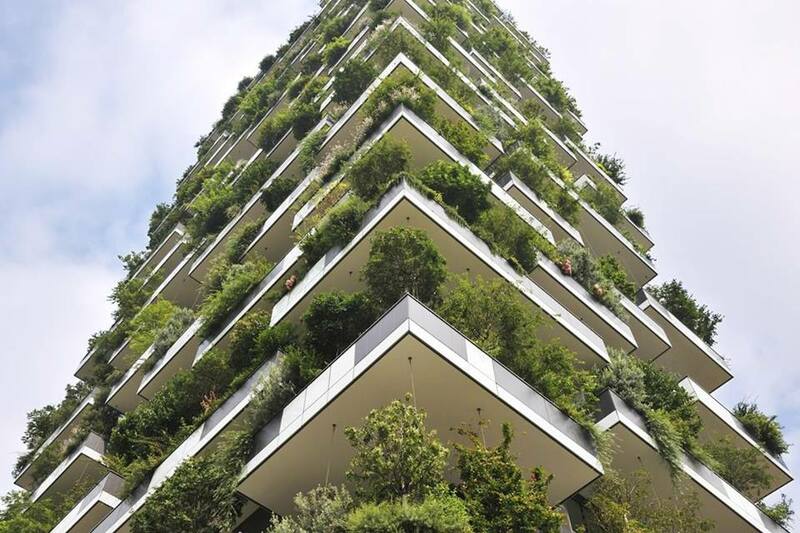 The architecture firm, Stefano Boeri, has designed several other eco-friendly and green projects around the world, including a “mountain forest hotel” in China and “urban tree lounge” in Italy. And they probably won’t be the last – the ambitious architecture firm aims to design vertical forests in Shanghai, Guizhou, Shijiazhuang, Liuzhou, and Chongqing. Stefano Boeri Architetti aims to continue to popularize the concept with a book edited by their China office and published by Tongji University Press, A Forest City. The book is scheduled to come out in April.